We have added a photo gallery to share some recent events. 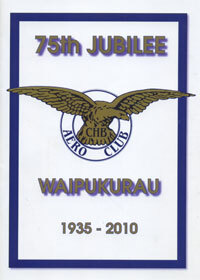 The annual general meeting of the CHB Aero Club is held in July each year at the clubhouse. The date will be advised here. All members welcome and encouraged to attend the meeting. Follow the history of the club from when it started in 1935 to present day. Phone Julia 027 211 9117 now for your copy. The Central Hawkes Bay Aero Club is situated at Waipukurau, approximately 40 minutes driving time south of Hastings in the province of Hawkes Bay, on the east coast of the North Island, New Zealand. The CHB Aero Club has an active flying membership and also many private owner members who keep their aircraft either on the airfield or on private properties nearby. Activities undertaken at the Club include an annual "Dawn Raid" which is usually held in May. The New Zealand Aerobatic Club holds their annual competitions here in March each year. The Club is active on weekends and at other times on request with the Chief Flying Instructor. To the east are beautiful sandy beaches and to the west the towering Ruahine Ranges.